Successfully Added GSM+PSTN Home Security Alarm System - 7 Inch Touchscreen, PIR Sensor, Door/Window Sensor, Remote Controls, Two-Way Audio to your Shopping Cart. 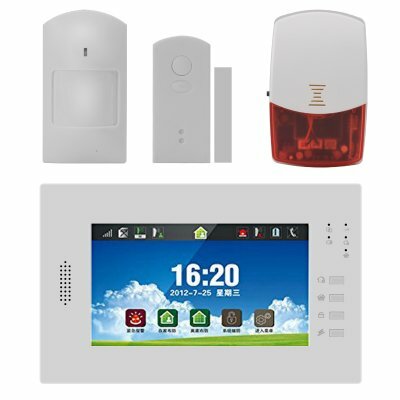 Keep your home safe and secure with an easy-to-use home security alarm system, coming with an interactive 7 inch touchscreen display, GSM+PSTN, support, PIR sensor, door/window sensor and more. Protect your home from unwanted visitors and travel worry-free, as this comprehensive home security system keeps an eye on your home. Thanks to GSM and PSTN support, it can alert you about suspicious activities via both the landline or mobile network. The alarm system gives you a nice 7 inch touchscreen display for easy operation and won’t be a hassle to set up. It comes with a wireless wide angle PIR sensor that will detect motion within the 10m area and send timely alerts. The door and window sensor can be mounted onto your main door, windows or cabinets and safes. It’s also a great tool to keep your children away from medicine cabinets or dangerous items in the house. The home security system comes with a powerful built-in siren that will produce flashing light and sound alerts. The built-in 1200mAh backup battery will make sure the security system keeps functioning even with no direct AC power source. With two smart remote controls and two-way communication, it’s an efficient solution you for your security and peace of mind. The GSM+PSTN Home Security Alarm System comes with a 12 months warranty, brought to you by the leader in electronic devices as well as wholesale home security alarm systems..